On Black Friday a friend of mine and I stopped by Pier 1 Imports. There, I fell in love with a pillow that featured a huge felt flower covering the front. I wanted it except it was like $50 (or something higher than $12, which is like my limit for pillows, haha). 1/2 yard of felt – get nice stuff on a bolt, not the crafting squares and not the stuff that is thin and looks like it may pull apart at a moment’s notice. This yellow felt is so dreamy and smooth! I got the felt and fabric from Pacific Fabrics. The fabric is Fandango by Kate Spain. Draw your circles using glasses or something round! Using your template, cut out felt. I cut out 4 circles at a time by folding the felt and pinning the template to them. My cat helped (she was laying on the felt and was very annoyed when I took it away to cut circles). I cut out 30 large circles and 20 small circles. In the end, this was too many. Cut the circles in half. I just folded two at a time and cut. Ta-Da!!! Now I had 60 big petals and 40 small petals. The next thing to do is cut your fabric that the flower will go on – I cut mine to 18 inches square. The directions say to finish the short edges, but you should finish one of the 18 inch lengths on each of the two rectangles. I figured this out after finishing the short edges and pondering why the pillow wasn’t going to fit together. Finally, with everything prepped, you can work on the flower! First, draw a circle on the top side of your fabric – I used the lid to a pot. Make sure to leave about 5 inches on all sides of your circle. Now it’s time to sew. Lay one of the big petals on your drawn-on circle, and sew it down. I stopped about 1/4 inch short of sewing the whole petal down, and then laid the next one down to overlap the first one. I continued this around the circle. The next row I moved the petal down about 1/4 inch and again went around the circle. I am a perfectionist and paid a lot of attention to how the petals were laying in relation to one another, and getting each petal just right. At this point, the cat was really annoyed that there was no fabric to lay on. On the 4th row, I started using the bunching technique to give the flower more volume. I bunched every single petal from here on out. All I did was make a little fold in the center of the flat edge that kind of looked like a ‘Z’, to increase the thickness of the petal and add some dimension. When the remaining fabric exposed in the enter was just less than 4 inches in diameter, I switched to the small half circles. I bunched all of these, too. It became very difficult for the last 2-3 rows because I was sewing round and round in tight circles, but I was very patient and bunched the felt just so. At this point I ended up stitching each petal down completely, and then backing up to give myself more room to scrunch up the next petal. Finally at the very end I cut a circle about the size of a quarter from my left over felt and stitched it in the center to cover the edges of the last row of petals. Ta-Da!!!! Now it was time to put the whole thing together. I laid my flower facing up, and then laid down one of my rectangles facing down aligned with the left side of the pillow, so the two right sides were together, and some of the pillow was still exposed. Next, I laid down the other rectangle in the same way, but aligned with the right side of the pillow to cover the exposed pillow. Then I pinned the whole thing together, and stitched around all the edges. I turned it inside out, and voila! A beautiful flower pillow. Of course by this time it was pretty dark out, so I had to use the flash. Now, I am not a sewing expert, but the tutorial said this would take 30 minutes, and it took me the better part of 5 hours! I took lots of breaks to take pictures, eat lunch, read and re-read the directions, try to figure out why I’d sewn the wrong seams, make sure I had enough fabric, struggle with perfectionism with the petals, but still. It was way more than 30 minutes. Maybe there was 45 minutes of sewing petals. I’d say altogether the pillow itself likely took me 2.5-3 hours. Finally, I was left with quite a bit of petals: 19 large and 14 small. I have a little bit of the orange fabric left, so I might make another flower to put on the remaining fabric and make something out of that. We’ll see. 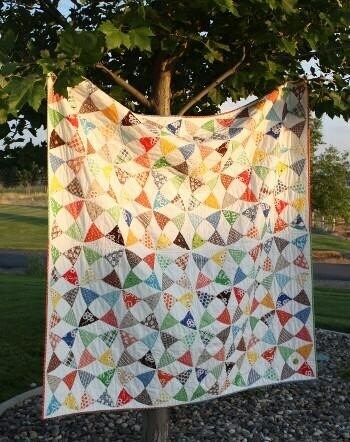 Also, I purchased a pattern for this quilt and I hope to embark on making my first quilt after the new year. Until them I plan on spending quite a bit of time contemplating fabric choices. Stay tuned.